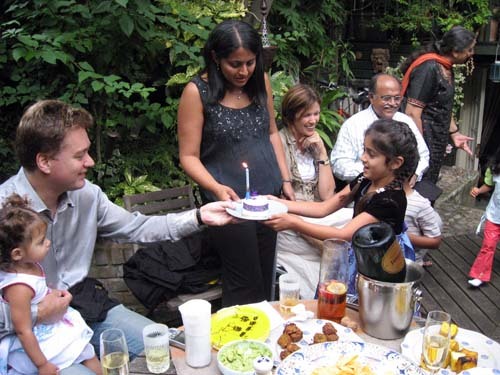 Stuart Cheshire had his 40th birthday party in London, England, and a bunch of us went over to celebrate it with him. Click on any picture below for a REALLY LARGE version of the same picture. 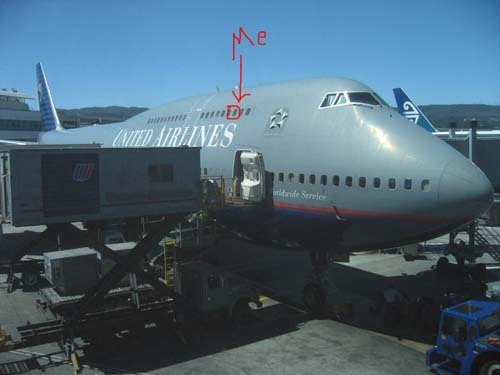 Below is my plane parked at SFO with my seat circled in red. I flew in the "upper deck" for the first time, it's pretty much like the lower deck -> a 10 hour bus ride with tiny windows. :-) I left on 8/14/07. 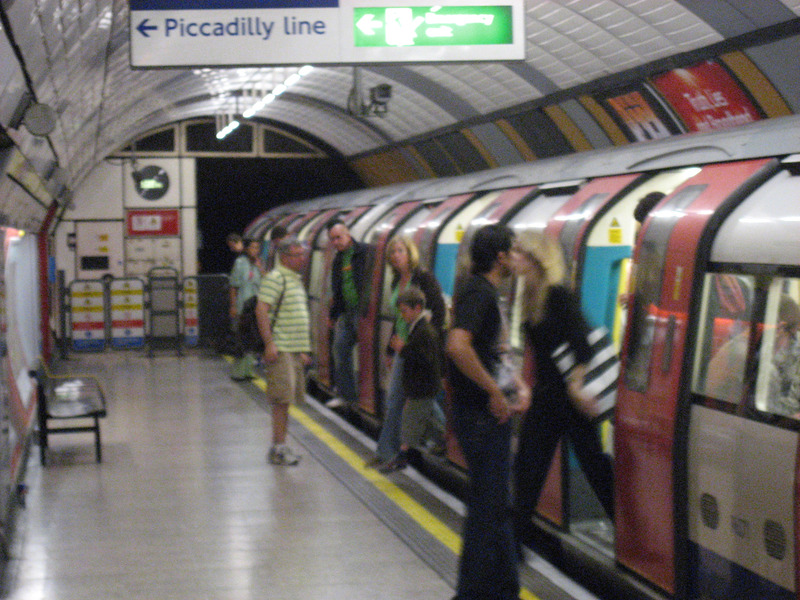 Here I am newly arrived in London on 8/15/07 taking the "Tube" (The London Subway) to Nilay's house. 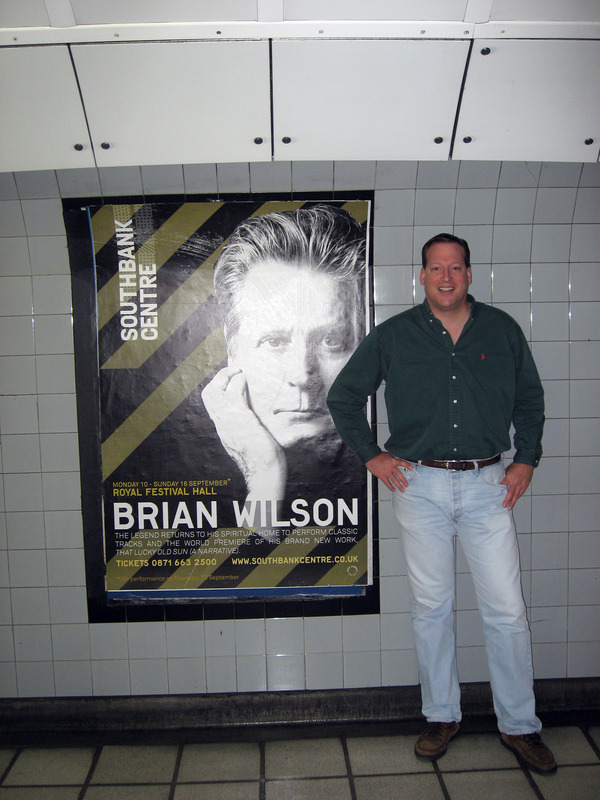 All over London in the "Tube Stations" there were advertisements for a "Brian Wilson" concert. "Brian Wilson" is my name and also the name of the lead singer of the super famous California band "The Beach Boys". 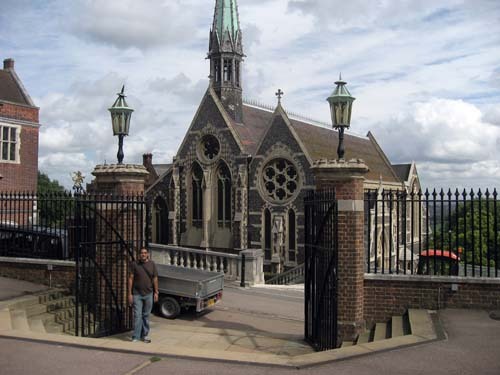 The first day I was in London (8/15/07), I stayed with Nilay Patel (who lives in London) and we walked around his neighborhood through the "Harrow School" which is a famous boys school (age 13 - 18) that Winston Churchill and Lord Byron attended (and many other famous people). 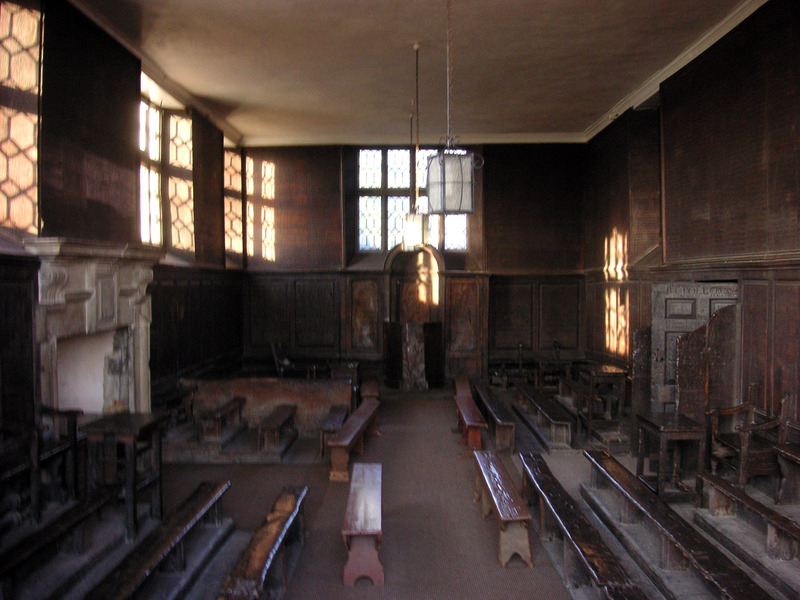 Also, several scenes from the "Harry Potter" movies are filmed at this location. 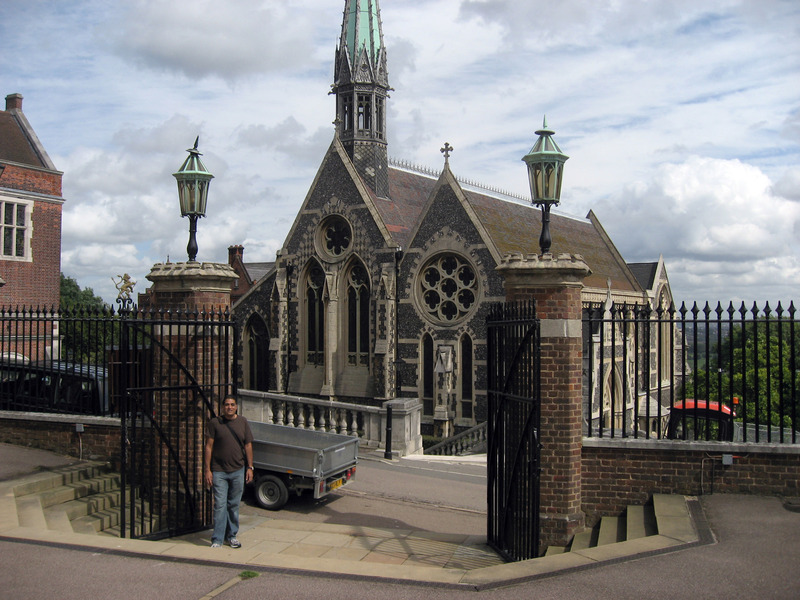 Below is Nilay posing for me on the Harrow School campus. Below is a picture of the "Fourth Form Room" at "Harrow School" in London which was one of the sets used in the "Harry Potter" movies. 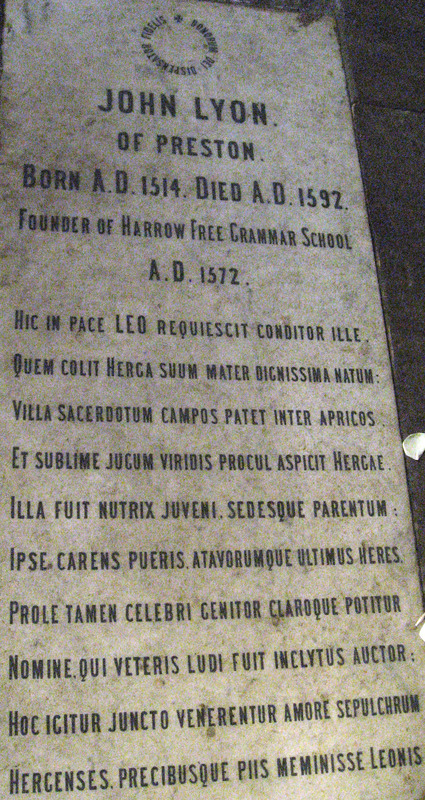 We peeked inside the Church and I took this picture of a plaque embedded in the floor of the Church mentioning that the Harrow Free Grammer School in London was founded in 1572 by John Lyon. 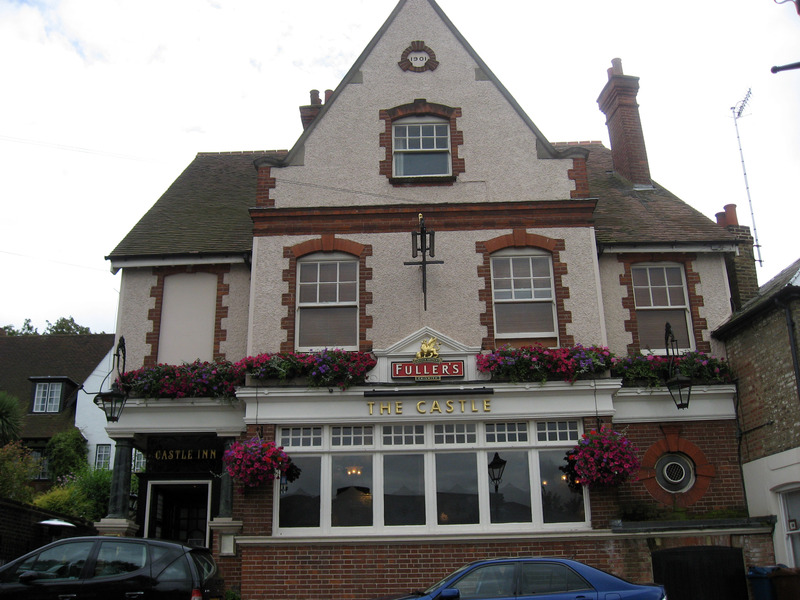 Nilay and I stopped in "The Castle Pub in Harrow" (at 30 West Street, Harrow, London) to have a pint. The beers on tap to choose from. The next day (8/16/07) was the first time Nilay and I met up with with the main birthday crowd. 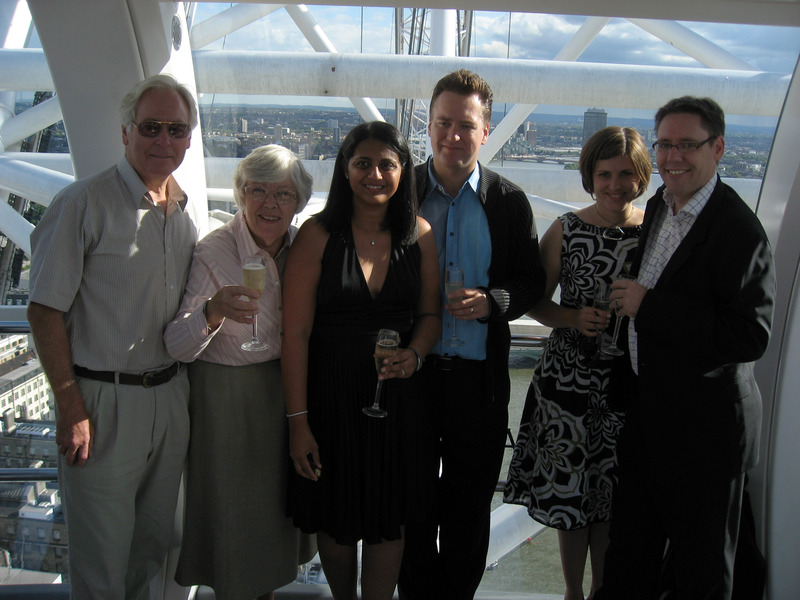 The first birthday event was a champagne toast on "The London Eye" which is the big Ferris wheel pictured below. Here we are at the bottom of the "London Eye" waiting for Stuart. 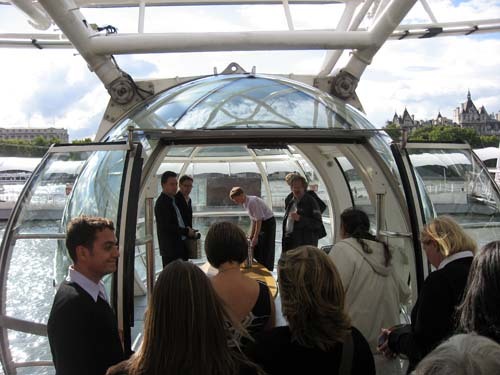 We reserved our own "Eye Pod" (that's a joke), here we are climbing aboard. 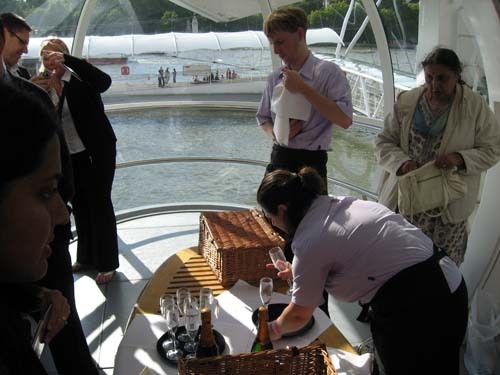 The waiter and waitress are preparing our champagne toast for Stuart. Here we are on The London Eye up in the air, this picture taken facing North along the River Thames. That bridge you see is the Hungerford Bridge. 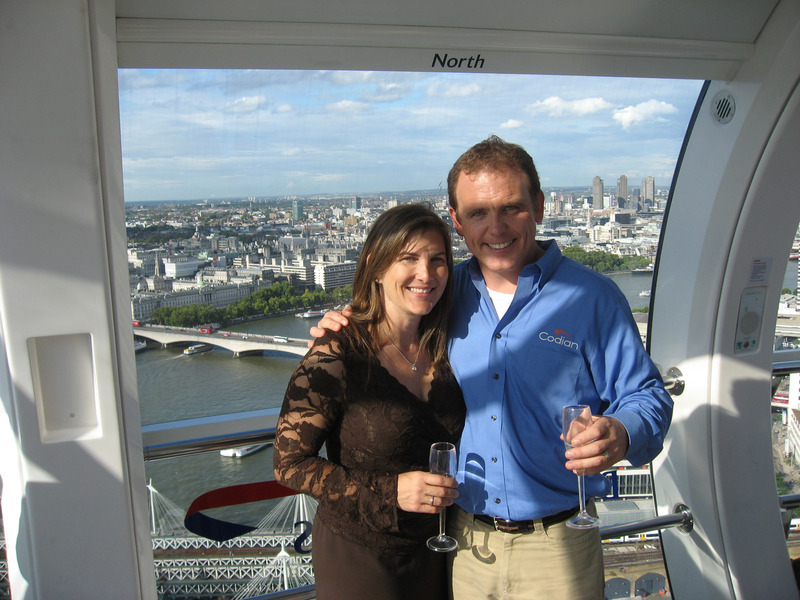 Lia and Will MacDonald riding on "The London Eye". 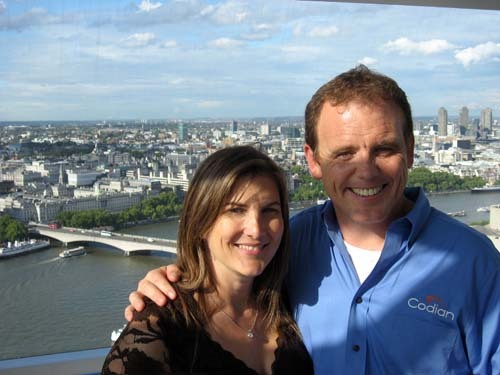 Different picture, same two people Will MacDonald and Lia MacDonald. 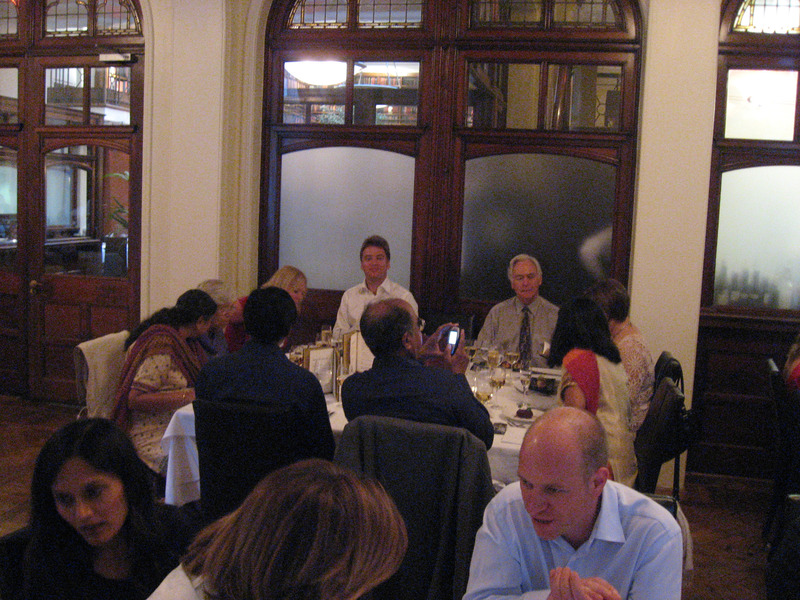 The Cheshire Family, that's Pavni Diwanji and Stuart Cheshire in the middle. Stuart's parents are on the left (David and Helen), and Stuart's sister Lorna Sparks and husband on the right. 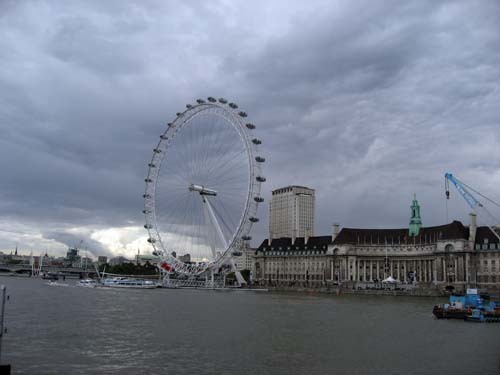 Below is a panorama picture taken while riding the London Eye. 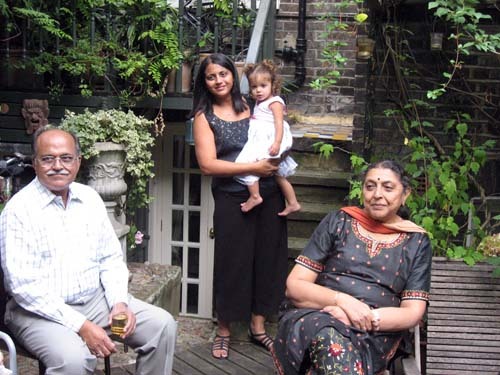 On the far left is Pavni, and on the far right is Pavni Diwanji's father Naishadh Diwanji. Nearing the top of the London Eye, you can see the "Eye Pod" in front of us peaking. 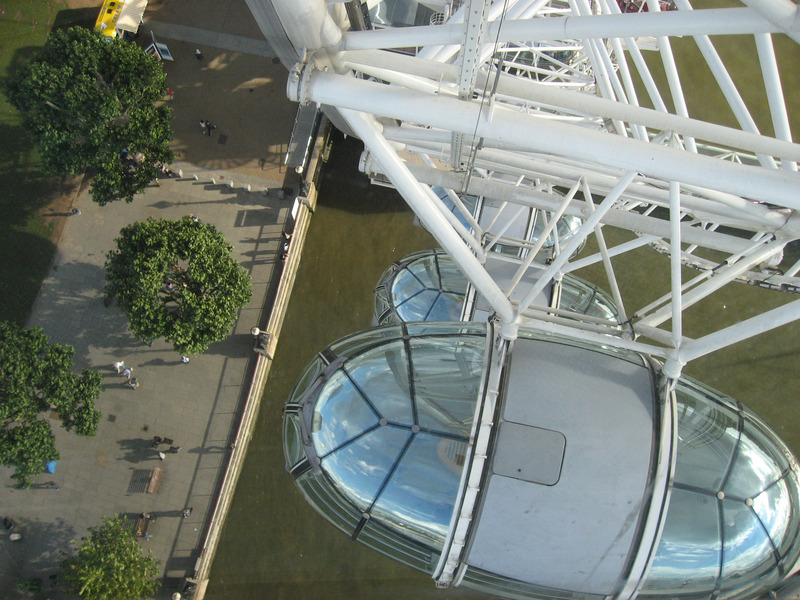 Staring straight down from the edge of the London Eye. 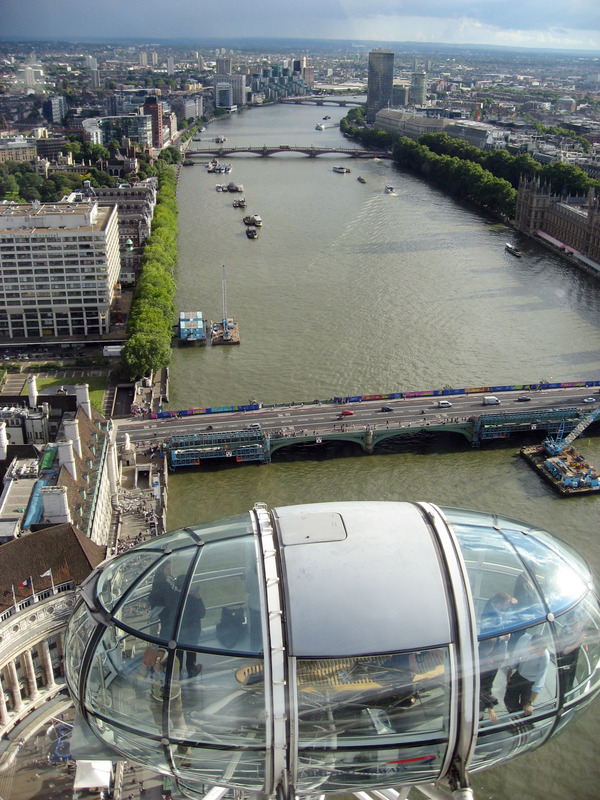 Looking south out of the London Eye over the River Thames. 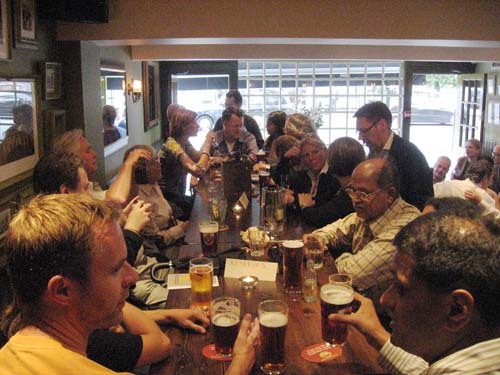 After the London Eye, we had a quick snack and a drink in the "Brass Monkey Pub" located at "250 Vauxhall Bridge Road, London". Below is our party. 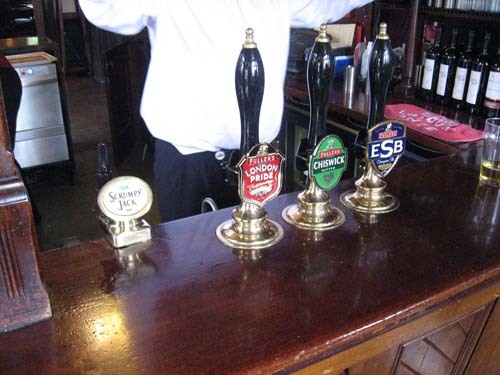 There are these "traditional beer taps" in England where the bar tender must physically pump the tap to get beer to come out. The picture below isn't great, but it shows one of these taps in operation. The blonde woman is pumping by pulling the long handle towards her. After snacks, we went on the the London musical "Wicked" at the "Apollo Victoria Theater". 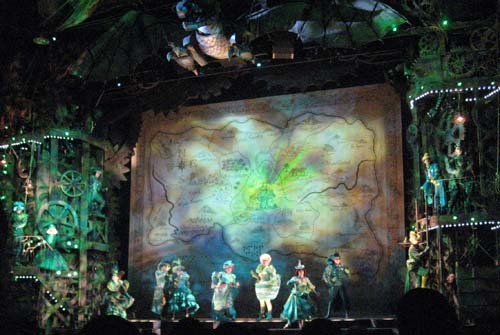 This show is all about "The untold story surrounding Wizard of Oz" that explains that the wicked witches weren't so wicked after all and explained where all Lion, Scarecrow, and Tin Man came from. Below is the stage before the show started. 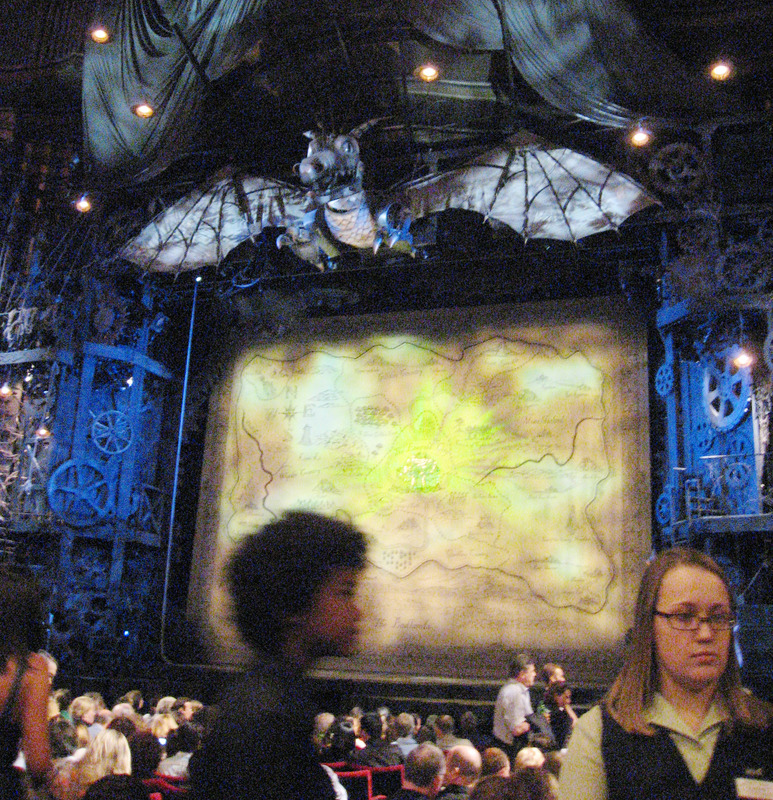 And another picture immediately after the "Wicked" show started. After the show, we went out for a last drink at the pub "Harlem" in Notting Hill. 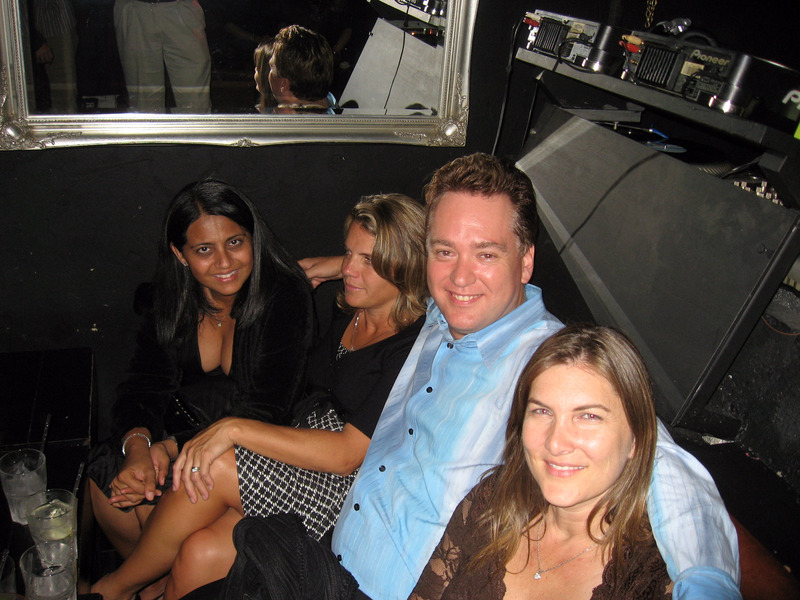 That's Pavni Diwanji on the far left, Wendy Riggs, Stuart Cheshire, and Lia MacDonald. The next day (8/17/07) I got up and wandered around Notting Hill a little. 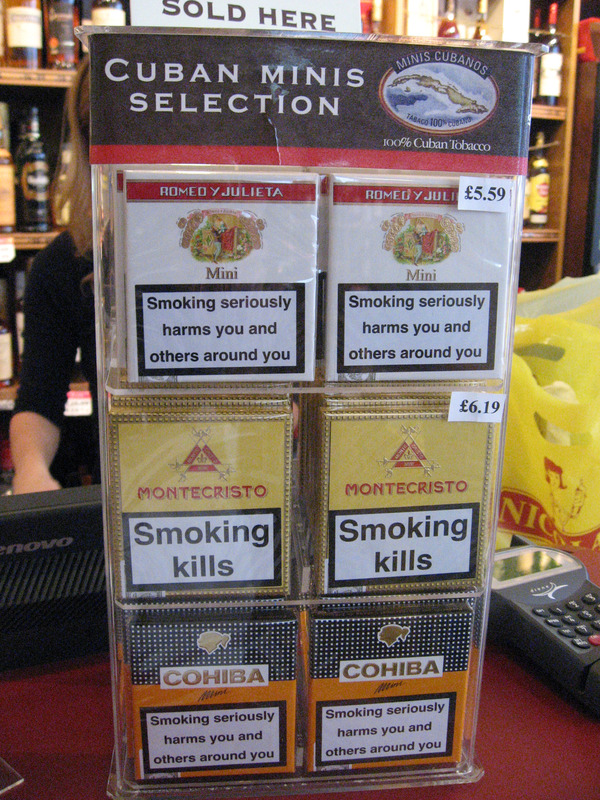 Below is a picture I took along the way of a cigarette display and the VERY aggressive messages they have printed on them in England such as "Smoking Kills" and "Smoking seriously harms you and others around you". Later in the day, Pavni holding her daughter Maya in the middle, and Pavni's father (Naishadh) and mother on both sides. Stuart holding his daughter Maya, with his daughter Ishani presenting Stuart his 40th birthday cake. 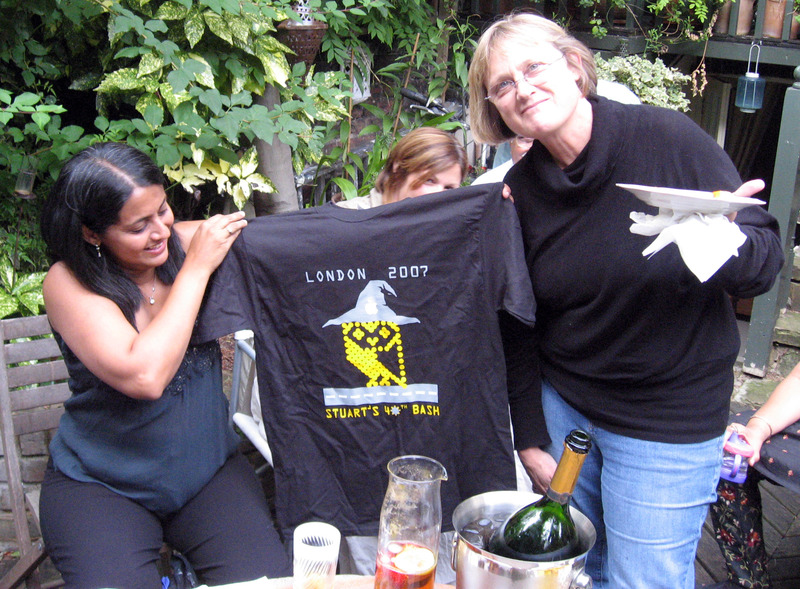 Mary Weeks (on the right) designed this T-shirt for the occasion which includes a lot of subtle references to Stuart's life. 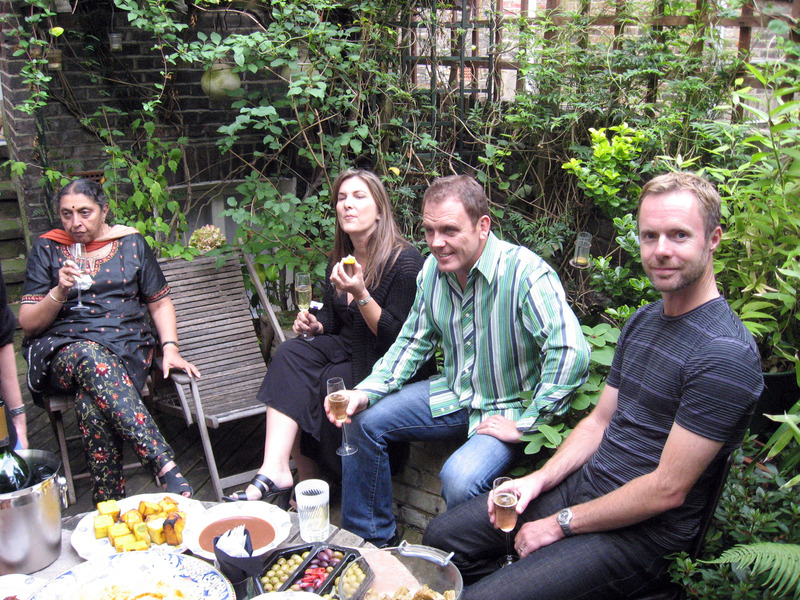 Other people in the back courtyard of 29 Chepstow Road in Notting Hill, London. On the far right is Nick Tingle looking at the camera. 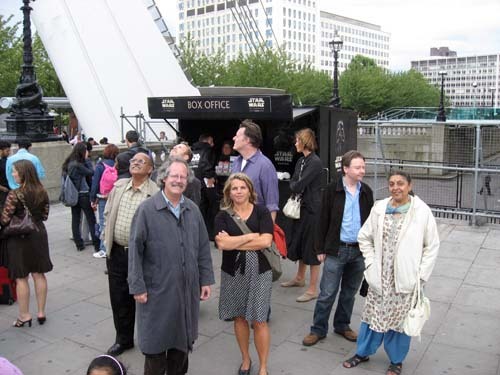 Later that night we went to "Jongleurs Comedy Club" in Camden. 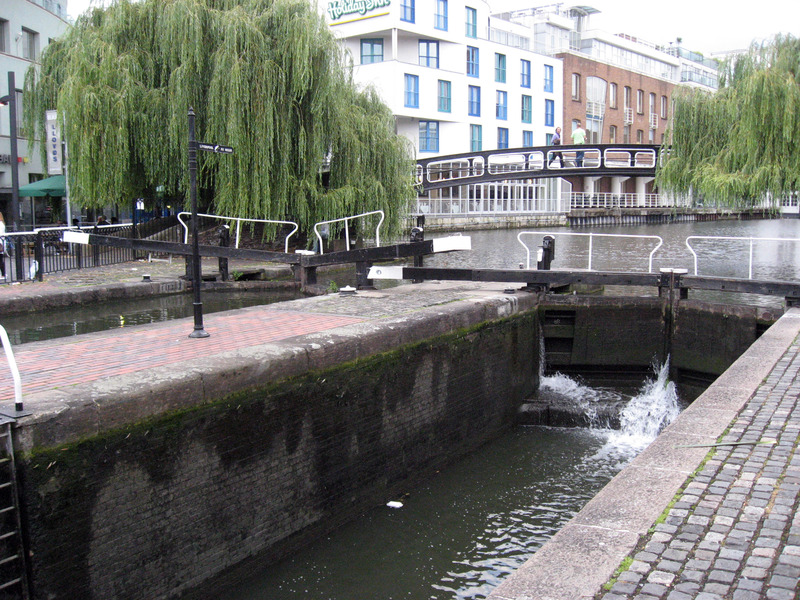 Below are the "Camden Lock" right outside the club. The next day (8/17/07) I went to "Harrods" in London, which is a famous very high end department store only found in London. Below is the front of Harrods of London. 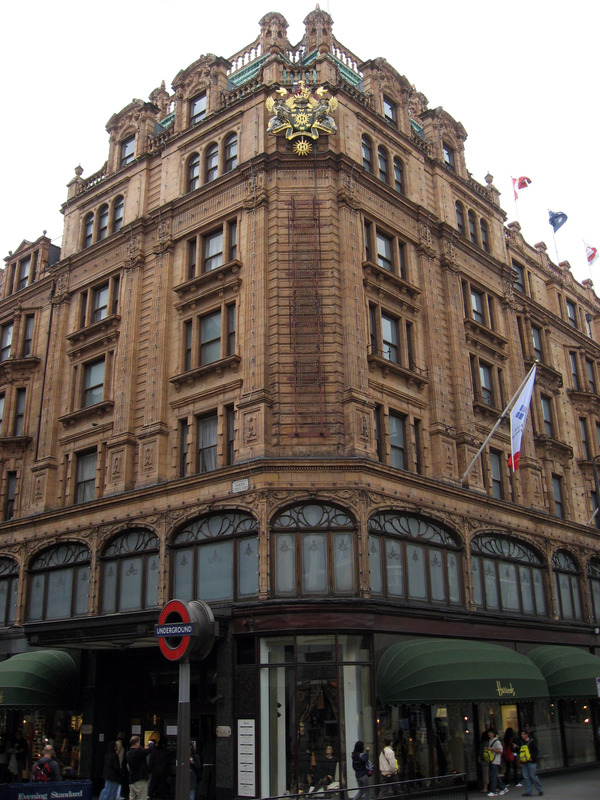 A wider picture showing Harrods Department Store in London is an entire city block. All the time I was in London I used "The Tube" (London Subway) and I wanted to get a picture of it. 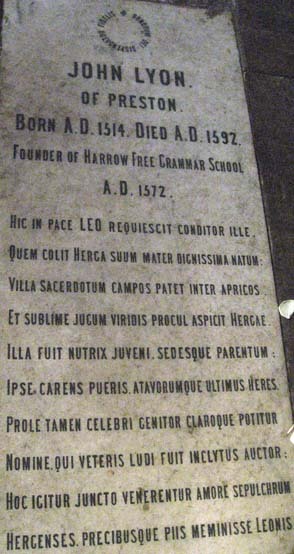 Below is a photo of the "Piccadilly Line" sign. 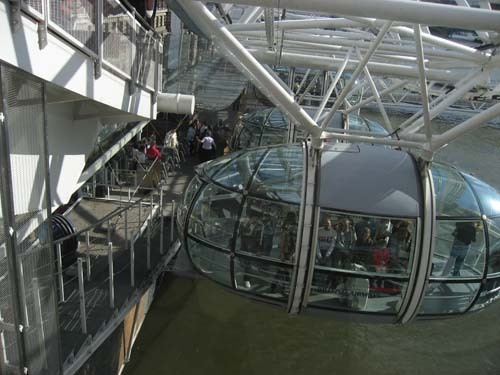 The tube is fast, never gets stuck in traffic, and extremely convenient and inexpensive. 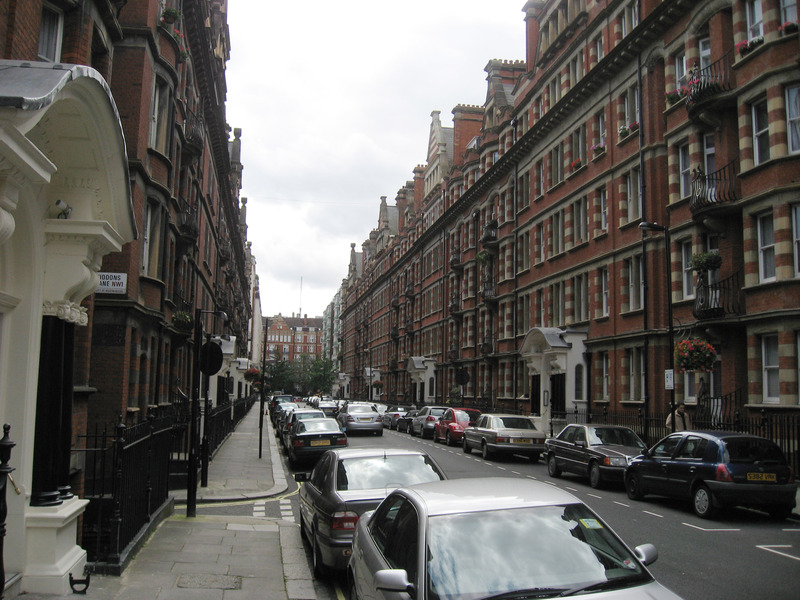 Here is a picture of a scenic street in London. These are the common heights of most of the buildings, which is about 4 or 5 floors high. 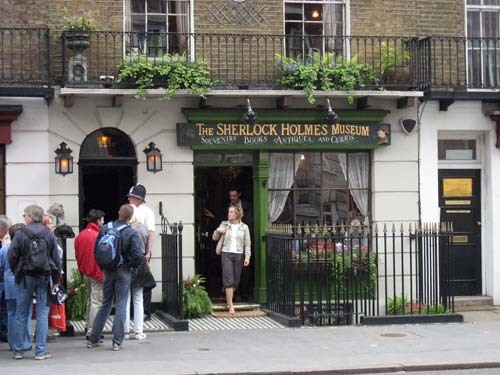 In the books by Sir Arthur Conan Doyle, the main character "Sherlock Holmes" lives at "221b Baker St, London, England". An enterprising person bought the apartment at that address and opened up a tourist trap of "The Sherlock Holmes Museum" in London. 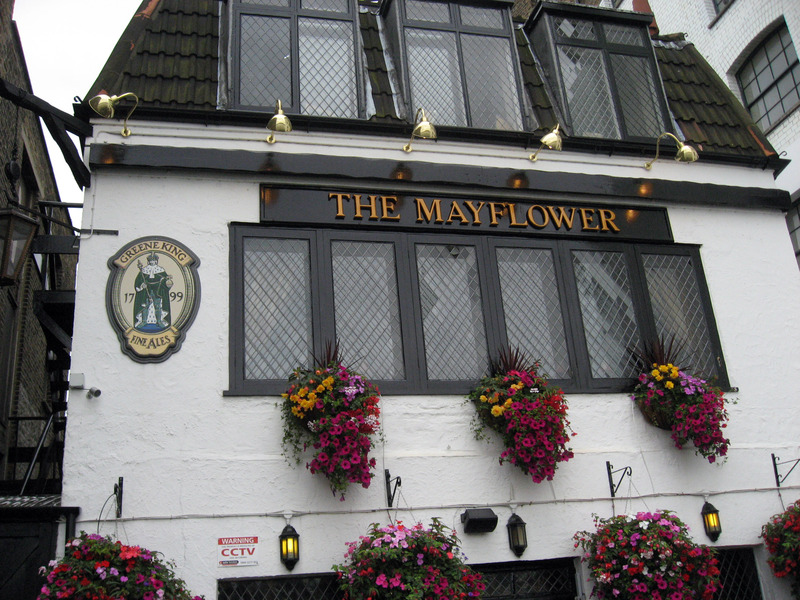 Nilay and I got a pint at "The Mayflower Pub" in London. 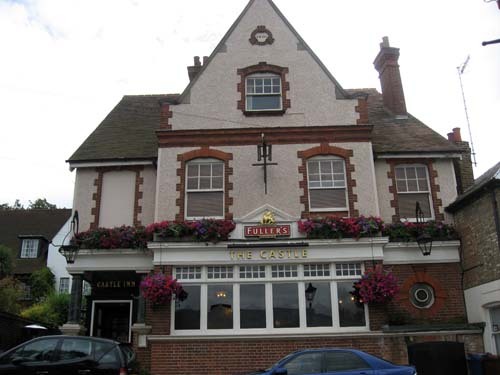 Supposedly, the famous ship that transported the first pilgrims to America set sail from this pub. I guess the pilgrims had their last pint of English beer and stepped onto the boat for the next 66 days of sailing. :-) The Mayflower set sail on September 6, 1620. 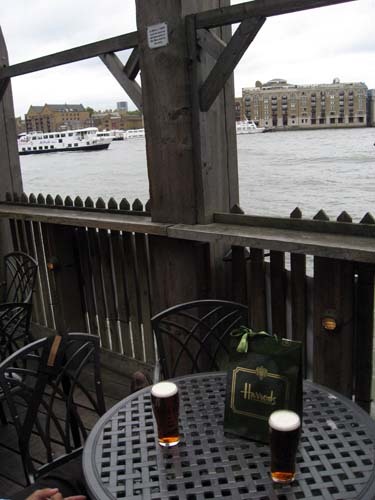 A couple of pints and a "Harrods Bag" sitting in the exact location the pilgrims left London bound for America aboard the Mayflower Ship. Later that night we all met for a really wonderful birthday meal at "The Cinnamon Club", which is a fabulous restaurant in London located in The Old Westminster Library (30-32 Great Smith Street, London). Below are a couple pictures of our tables in our private room. In the lower left of the picture below in black hair facing the camera is Komal Shah. 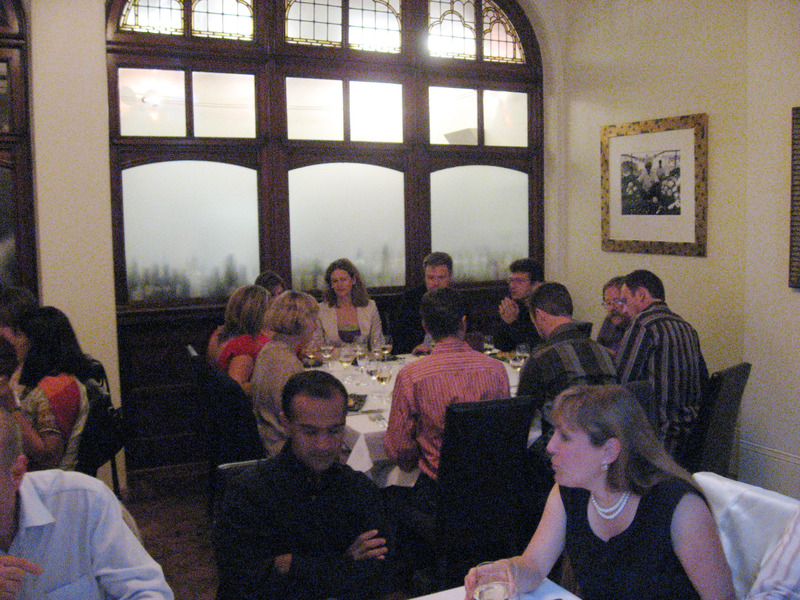 We had three tables in this private dining room. 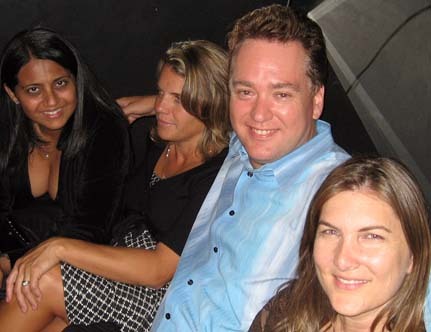 In lower center front is Gaurav Garg, lower right front is Heather. Random note: after dinner at "The Cinnamon Club", we went out for a martini at "The Egerton House Hotel" which is located at Egerton Terrace, Knightsbridge, London SW3 2BX. Antonio is the famous bartender that makes martinis here, he has been written up as making the best martinis in London. The next day (8/19/07) I went for a stroll through Hyde Park in London which was walking distance from my hotel in Notting Hill. Below is a picture of "Round Pond" in Hyde Park, London. Random note: I stayed at "Guesthouse West" at 163-165 Westbourne Grove, Notting Hill, London, W11 2RS. It was nice and modern (including air conditioning) and very clean. Pictured below is "Italian Gardens" in Hyde Park, London. 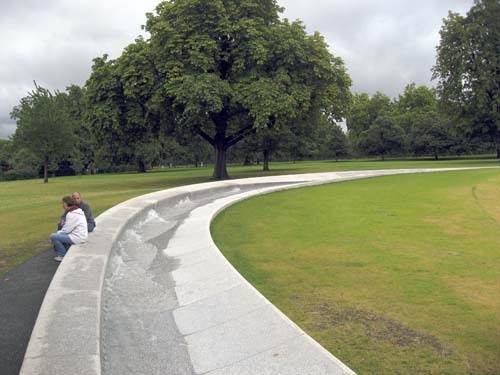 Below are two pictures of the "Princess Diana Memorial Fountain" in Hyde Park, London. It is a running water circle fountain that you can take off your shoes and walk in. 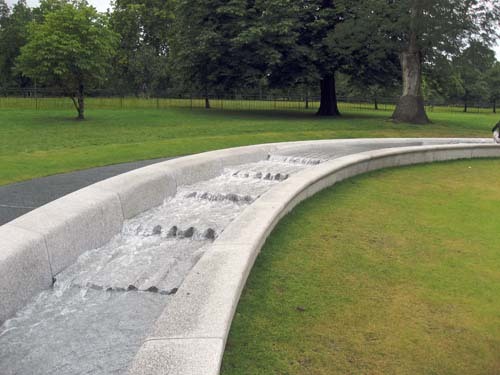 Another picture of a section of the "Princess Diana Memorial Fountain" in Hyde Park, London. 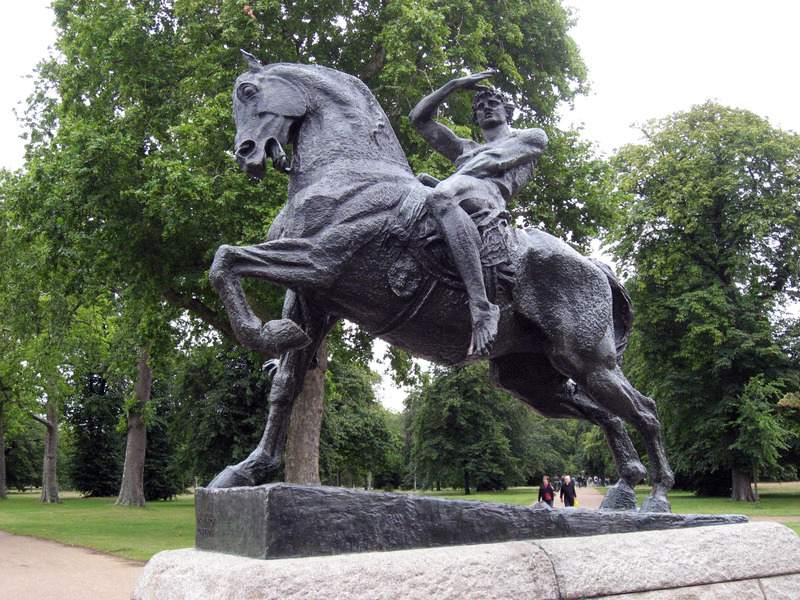 The statue pictured below is called "Physical Energy" by sculptor G.F.Watts (George Frederick Watts who lived from 1817-1904) and is located in Hyde Park, London. 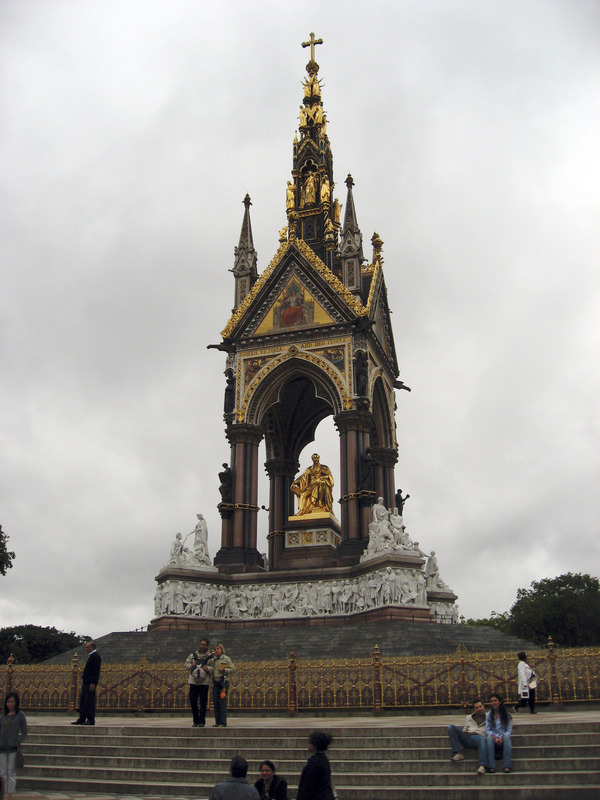 Below is the "Albert Memorial" found in Hyde Park, London. It was completed in 1876, and it is from Queen Victoria memorializing her recently deceased husband Albert (Albert died of typhoid after 22 years of marriage, at that point Queen Victoria was a 42 year old widow). 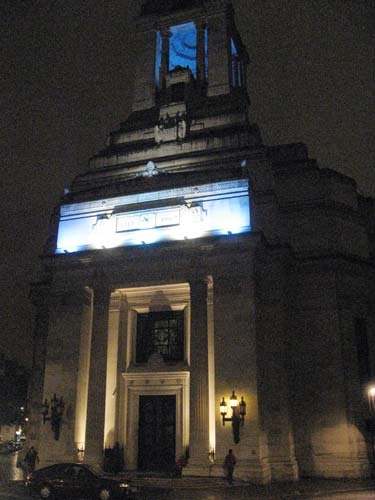 I'm currently reading the book "The Da Vinci Code", and so later that night as Nilay and I walked past the London Freemason Hall he pointed out that it plays a part in the book. Below is a picture of Freemasons' Hall in London on Great Queen Street, London. 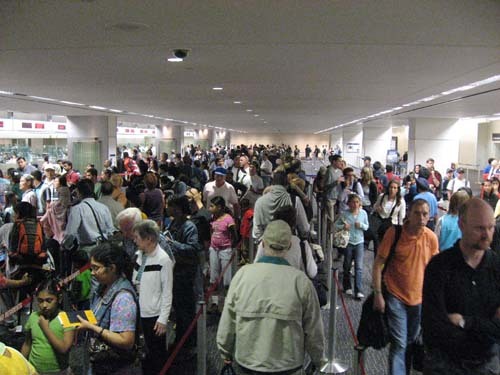 I flew back to San Francisco the next morning, here I am stuck in the enormous line to get through passport control in SFO airport.